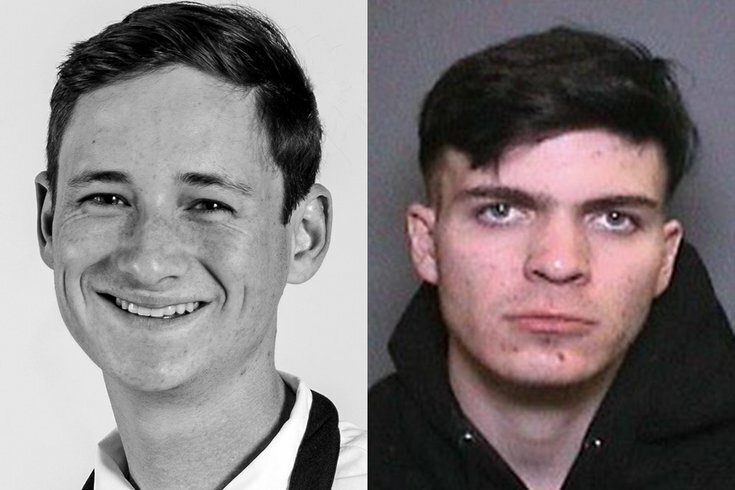 Samuel Lincoln Woodward, 20, right, is charged in the murder of University Pennsylvania student Blaze Bernstein, left, in California. The California man accused of killing University of Pennsylvania sophomore Blaze Bernstein earlier this month is a self-proclaimed neo-Nazi and a member of a Fascist group that aims to overthrow the U.S. government, according to a report. Samuel Woodward, 20, was charged with murder on Jan. 17 in the fatal stabbing of Bernstein, who went missing on the night of Jan. 2 while he was home with his family on winter break in Lake Forest, about 40 miles southeast of Los Angeles. The body of Bernstein, 19, was found eight days later in an Orange County park with more than 20 stab wounds. Recent media reports on Woodward in recent weeks brought to light a disturbing social media history suggesting that the 20-year-old may have held extremist, anti-Semitic beliefs. Woodward reportedly told detectives that Bernstein, who was Jewish and gay, kissed him on the night that the Penn student went missing. Prosecutors have said they are investigating whether the death was a hate crime. But a report published Friday in ProPublica, citing three anonymous sources, said Woodward was a member of the Atomwaffen Division, an obscure but notorious extremist group that allegedly hopes to someday overthrow the U.S. government through terrorism and guerrilla warfare. The site, which spoke to two of Woodward's friends and one former Atomwaffen member, reported that the 20-year-old joined the organization in early 2016 and obtained pictures that appear to depict Woodward in Texas at a three-day training camp, which included instruction in firearms, hand-to-hand combat, camping and survival skills. One picture shows Woodward and two other members making a straight-armed Nazi salute while wearing skull masks. The group, whose members are said to celebrate Hitler and Charles Manson, is believed to consist of about 80 people across the country, according to the New York Daily News. A website for the group states that "the failure of democracy and capitalism has given way to the Jewish oligarchies and the globalist bankers resulting in the cultural and racial displacement of the white race." The group, whose name translates roughly to "Atomic Weapons Division," first gained attention when it posted recruiting posters at several college campuses, inviting students to "Join Your Local Nazis!" The organization then made national headlines earlier this year when an 18-year-old founding member, Devon Arthurs, allegedly killed two of his roommates and fellow members after they taunted him over his conversion to Islam. When authorities searched the Tampa, Florida apartment where Arthurs lived, authorities found bomb-making material belonging to a roommate who turned out to be Atomwaffen leader Brandon Russell, a member of the Florida National Guard. Arthurs reportedly told authorities that Russell, who pleaded guilty to illegal possession of explosives earlier this month and was sentenced to five years in federal prison, had planned to blow up a nuclear power plant near Miami. Woodward is set to be arraigned on Feb. 2 and has not yet entered into a plea. In an interview last week with the Los Angeles Times, Bernstein's mother, Jeanne Pepper Bernstein, said she had long worried that her son would become a target. "I'm concerned about the fact that he is Jewish. I'm concerned with the fact that he is gay or the fact that he is small," she said. "I was concerned for his safety always. I was concerned sending him out into the big world. But at some point you have to let go and they leave the nest and fly. I couldn't protect him from everything." His parents have urged those following the case to do good for their son in honor of his own aspirations that he was never able to fulfill. "We can't worry about things that cannot be fixed," Bernstein's mother told the Times. "I can't bring my son back. I can't fix him and inject him back into his life. … So the next best thing is to bring goodness to the world that he would have brought if he could."